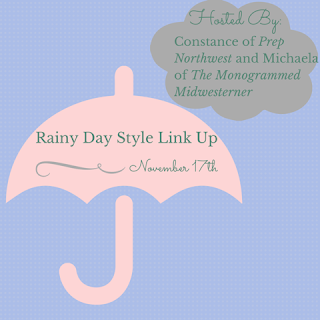 I'm super excited to link up with The Monogrammed Midwesterner and Prep Northwest for their Rainy Day Style Link Up! I included a few older photos of my favorite rainy day looks. What’s your favorite way to keep warm on a rainy day? Layers, layers, layers! I just really try to tuck my socks into my pants and keep my feet dry. Are you a hood, umbrella, or both kind of girl? Both, but probably more hood! I wear my monogrammed rain jacket absolutely everywhere. I used to never carry an umbrella until I got to college and was walking everywhere I had to have one! What is your best hair tip for a rainy day? Don't do anything.... I love the days that I don't have time to dry my hair and find out that it's raining! But other than that, I just do a braid to keep it out of my face and still cute! I really love just staying inside and not doing much... on this rainy day I had to go to class but enjoyed coming back in and cleaning and getting some stuff done! Check out their posts for a giveaway and more posts! I love your outfits, especially the dress with sandals! Thank you so much for linking up! I absolutely love both of your outfits - you're always adorable!